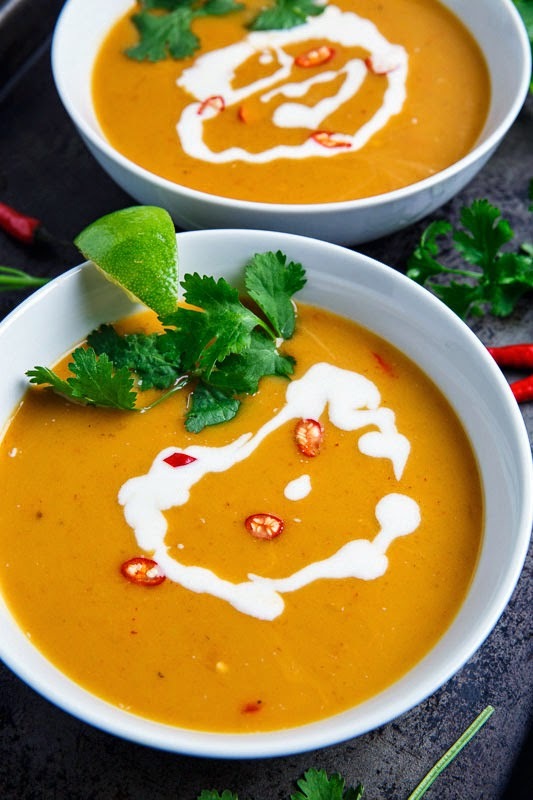 A tasty Thai inspired pumpkin and coconut soup that that takes less than 15 minutes to make! One of my favourite ways to enjoy pumpkin has to be in this tasty Thai pumpkin soup that literally comes together in less than 15 minutes! I first posted this recipe a few years ago so the photo was a bit dated and with all of the fresh pumpkins around it was the perfect opportunity to update the photos along with the recipe! This recipe really only has the four main ingredients, the red curry paste, broth, coconut milk and pumpkin puree along with some seasonings including fish sauce, sugar and lime juice. These seasonings are there to create a perfect balance of salty, sweet and sour along with the spicy aspect from the curry paste itself! 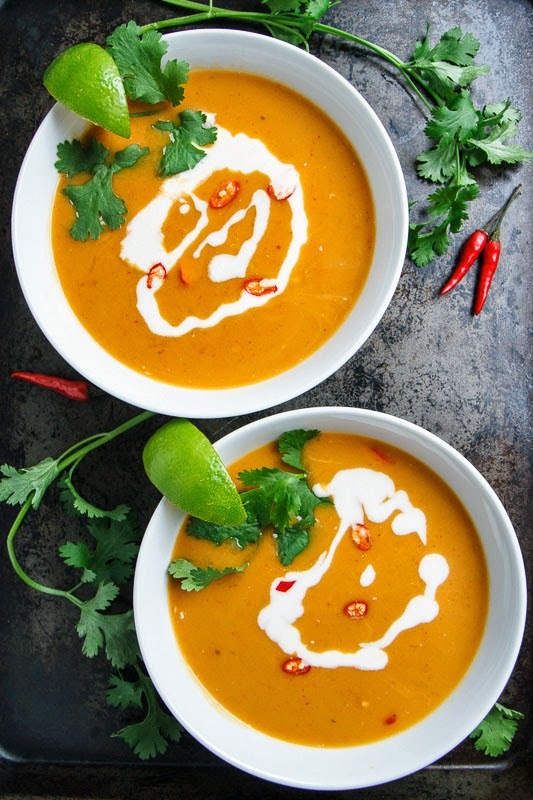 Canned pumpkin puree is really convenient for this soup (and it allows you to make it year round) but you can also use homemade pumpkin puree or even raw pumpkin where you would simply add diced pumpkin to the broth and coconut milk and simmer until tender, about 15-20 minutes. This soup works both as a starter or side and as a meal and you can easily add things like chicken, noodles, tofu, veggies, etc. The next time you are thinking about making soup, don’t reach for the canned stuff, this soup only takes a few minutes more and it is so much better! Try adding peanut butter! 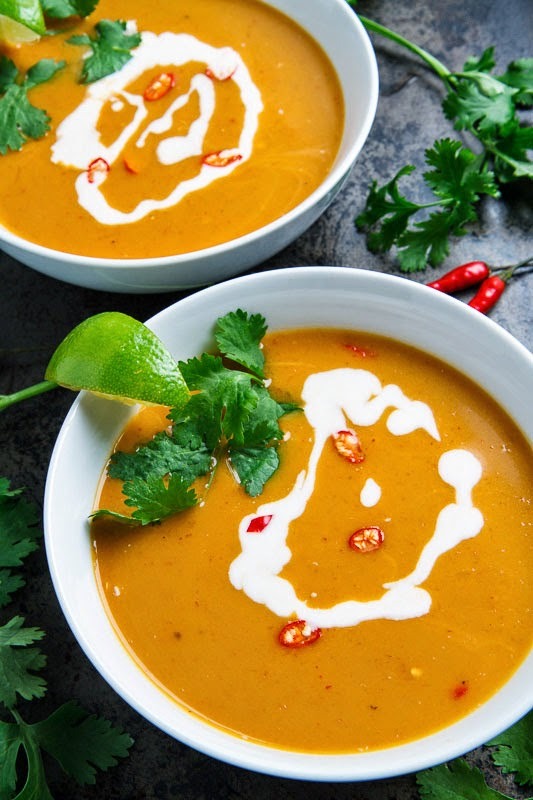 It takes this Thai pumpkin soup to whole new levels of tasty goodness! Heat a large saucepan over medium heat, add the curry paste and cook, stirring, until fragrant, about a minute. Add the broth, coconut milk, pumpkin puree, fish sauce, palm sugar and lime juice, bring to a boil, reduce the heat and let simmer for 5 minutes. Note: If you want to start with raw pumpkin, get two small 3 pound pumpkins, peel them, seed them, cut them into 1 inch cubes, add to the coconut milk and broth and simmer, covered, until tender, about 15-20 minutes, before pureeing. Option: Use another sweet winter squash like butternut squash or kabocha instead of pumpkin. Option: Add 1/4 cup peanut butter! Try it, you’ll love it! I am a big fan of simple and this recipe takes the cake;) I wonder if I could get away with canned pumpkin…what do you think? By the way, I made the pork again and was able to snap a picture this time so I’ll be posting it soon! Great fusion ingredients in this soup, good on ya. I love pumpkin soup but have never had it with Thai flavours. Gotta try it. This looks perfect! 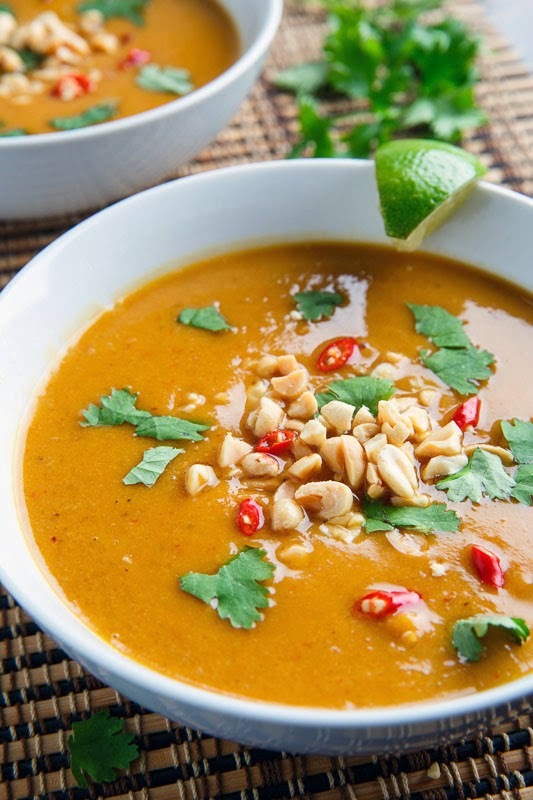 I love thai curry paste and using it in a pumpkin soup sounds just right. And you definitely can’t beat how simple it is. I am bookmarking this! This soup is calling to me. I love those flavours! Oooh some of my favorite things together in a beautifully colored soup! I just tried pumpkin soup from the supermarket…bleck! This is so much more satisfying, love the Thai flavors that you used Kevin! Heartwarming is the first word that comes to mind Kevin. Once the temperature drops we all need soup in our lives. So in love with the flavors here, Kevin! Love the ease as much as I love the flavors. Such a gorgeous, delicious bowl of soup! Lovely photos and delicious soup! Pumpkin soup is one of my favorites but I love that extra taste you added here! Can't wait to enjoy a big bowl of this on a chilly night! Kevin, love that you made a Thai pumpkin soup. . everything sounds and looks so delicious!! and love the option of adding peanut butter!! love!! Made it yesterday and it was so delicious and simple! Thank you!! Kevin I love this pumpkin soup! beautiful!! BIG HIT at Thanksgiving! Yummm! Just add crackers/croutons/bacon bits for some texture and you're golden! I will be making it again (soon)! This was quite bland, especially considering it's Thai inspired. Good bones but I had to add quite a bit to it to make it palatable. Unknown: Did you use a homemade Thai curry paste or a store bough one? If store bought, what brand was it? Can you tell me what the white substance drizzled on the top of the soup is? ******: The white drizzle is coconut milk! Enjoy! This is a keeper. Fast and full of flavour. This soup was so delicious. Adding peanut butter made it taste so much richer. If you like pumpkin soup, try this.